Amid the stillness of the city, wrapped in a shroud of darkness punctuated by diamond-like sparks from the cityscapes, a mysterious creeping creature appears. Its predatory air and stealthy prowl foreshadow a powerful revelation. 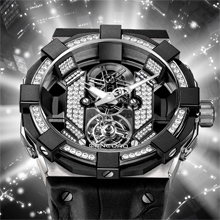 The C1 BlackSpider unveils a dramatic mutation with dazzling diamond brilliance adorning its horological arachnid body parts. This potent and exquisitely shimmering transformation captures the fascinating paradox between the distinctive horological design and authentic prowess in the realm of horological mechanics. 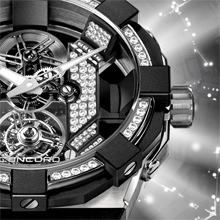 The fascinating arthropod appears to be suspended in mid-air, with eight legs firmly embedded in the generous 47 mm-diameter, 13.55 mm deep ultra-light titanium case – while the movement plate, symbolizing its abdomen and also serving as the watch dial, lies at the bottom of the empty space created by the remarkable depth. The watch movement elements aligned down the middle reveal the nerve center of this mesmerizingly disturbing creature. The rhythmical oscillations of the tourbillon mechanism occupy a space of their own, entirely in tune with the gravity-defying nature of this emblematic beast. 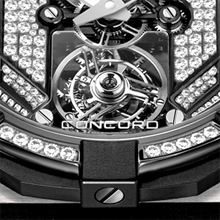 The cut-outs admirably highlight Concord’s fundamental construction principles – including its sturdy design, side-screwed protective ring, “ramparts” protecting the anti-reflective sapphire crystal and fortified crown – while accentuating the “camouflage” effect that helps it merge smoothly into its natural metropolitan environment. This is a creature that deserves to be viewed from both sides, and the exhibition case-back reveals the handsomely decorated 19-jewel hand-wound C105 movement, with its sandblasted and polished bridges, steadily beating at 21,600 vibrations per hour. This dramatic new predator clings firmly to the wrist on a black rubberized alligator strap held by four self-locking screws and a smoothly flowing lug-free attachment construction. A brilliant new form of watchmaking life has escaped from the C Lab: the electrifyingly resplendent C1 BlackSpider Brilliant is out there, thriving in the radiance of the city lights – meticulously spinning its web as it prepares to attract and capture its doubtlessly willing prey.